Ray Lampe may be better known to the world as Dr. BBQ, and with good reason. He turned his outdoor cooking hobby into career, authored five books on the subject, and has been on TV many times to share his techniques. Check out his other recipes on our website, and heat up the grill. This is a simple recipe that works on the grill or in a pan stove top, though it will lose some of the magical smoky quality. It starts with a spice rub, the foundation for all good things. Bitter ground coffee, paprika and salt help create a charred crust for meaty, bone-in Berkshire pork chops. If you haven’t rubbed coffee on meat before, you will be amazed at the added depth of flavor. It will work on ribs, steaks, chops, you name it. 1. To make the rub, combine the salt, coffee, paprika, granulated garlic and lemon pepper in a small bowl. Mix well. 2. Season the pork chops evenly on both sides with the rub. 3. Prepare the grill for cooking over direct medium-high heat. 4. 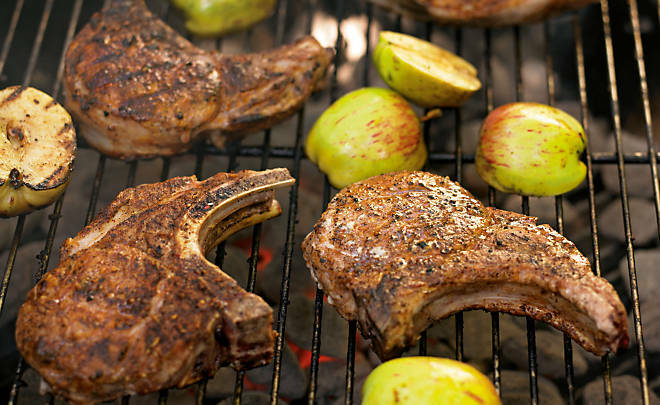 Place the chops directly on the cooking grate. Cook for 5 minutes. Flip and cook another 5 minutes for slightly pink and juicy, or to your desired degree of doneness. 5. Remove to a platter and let rest for 4 minutes.